While a tankless water heater for a restaurant might sound like a strange idea, many restaurant owners swear it is also an amazing one. They aren’t just simpler to use, not merely faster; it also turns out you can save on water heating expenses with one of these. So, if you’re looking for a water heater for your restaurant, you should consider these five tankless models. Every restaurant has a constant need for a steady supply of hot water. Whether it’s for kitchens or bathrooms, an empty tank and cold water are simply not an option for a decent restaurant. When you ask a restaurant manager which problem scares them the most, the answer is a broken water heater. So, most restaurants are buying big tank water heaters, and paying a lot every year just to keep those running. But, what else can you do? Get a tankless water heater for your restaurant – you will save money on repairs, water heating bills, and maintenance. In order to make this decision and this purchase easier for you, we made a top list of the best restaurant tankless water heaters available. When it comes to this model, there isn’t anything we dislike about it. It weighs 79 pounds, and its dimensions are 18.5” x 9.8” x 27.5. It can be easily installed, and it doesn’t take up too much space, so it doesn’t matter how big or small your restaurant is – it will fit. Thanks to its stainless steel condensing heat exchanger, this water heater is 94% energy efficient. This Rheem model truly utilizes each and every ounce of energy that comes into it, which means it’s actively saving money. All Rheem products meet and exceed reliability and quality standards of the industry. If we’re talking about high-quality products that can truly last a lifetime, we have to say these products have the most potential. They even offer a limited warranty for each and every one of their tankless water heaters. As for controls, this model comes with electronic controls that are made to increase safety and energy efficiency to the maximum. For this model, you need a venting system. You can use up to 38 feet of 3” PVC pipe or 5 feet of 2” PVC pipe. What’s interesting about this model is the fact that if you tried googling “electric water heater for restaurant,” this model must have come up, even though it is clearly not an electric model. Well, there’s a good reason for that. Many people who started looking for electric models ran into this one and decided to go for it. But, why? Well, this outdoor model with a condensing vent already has one big advantage people with smaller restaurants like. You install it outside of your establishment. Its condensing front exhaust is there to make sure that each ounce of energy is used the best way possible. What we like is the fact that with this model, that’s actually quite an amount of energy. Its BTU is 199.900, and its GPM is 11.1, which is perfect for a restaurant. This Noritz model weighs 66 pounds, it uses natural gas, and its dimensions are 9.4” x 18.3” x 24.4”. When you take all of this into consideration, it becomes apparent that, whether your restaurant is big or small, you can use this Noritz natural gas model. The fact that it reduces natural gas bills by 50% will definitely not do any harm either. Takes a few seconds to reach the top set temperature of 120 degrees. 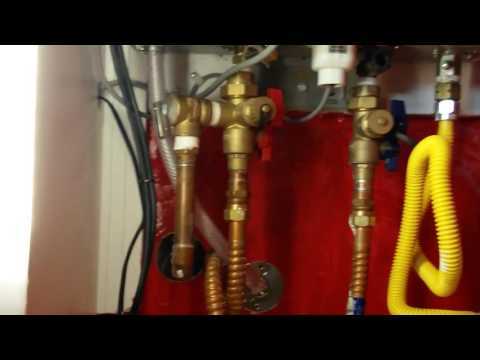 Did you ever look up “benefits installing tankless water heater for restaurant”? You didn’t? Well, that’s a shame because this Rinnai model is the perfect example of all of those benefits. This tankless water heater weighs 71 pounds, and its dimensions are 26” x 10” x 18.5”. It delivers 199.000 BTU and 9.8 GPM. It’s simple for maintenance, it’s compact, and it is energy-efficient – everything one should look for in a tankless water heater. This model boasts an incredible 96% energy efficiency rate, of course, thanks to its condensing system. It’s fast and reliable, which will enable your business to work at full capacity non-stop. What we like here are the maintenance alerts this water heater gives. As soon as it is time for you to clean your water heater, it will let you know. Another big plus here is the fact that this model offers additional venting options, so it’s rather flexible when it comes to installation. The warranty here is pretty straightforward – you get six years on the heat exchanger, five years on parts, and one year on labor. If you need a simple product that will satisfy your restaurant’s basic needs, look no further. This model weighs 59 pounds, its dimensions are 12.5” x 18.5” x 29.5”, and it is the best light commercial tankless water heater we have found. Maximum BTU input for this model is 199.000, while maximum GPM Is 9.0 – just enough for commercial use, but not enough for a large establishment. However, it is easy to install, and it comes with great safety features. It has an overheat cutoff fuse, as well as exhaust and water temperature safety controls. What we appreciate here is the confidence this company has in its product. The warranty is five years on the heat exchanger, and another five years on parts if used for commercial purposes. With all the wear and tear that’s expected, this is more than good. When it comes to thermal efficiency, this model maintains a rating of impressive 96%. This tankless water heater, which was designed for indoor mounting, weighs 88 pounds and its dimensions are 15.2” x 17.4” x 13.1”. 199.000BTU and 11 GPM is definitely enough for a restaurant, while the fact that it spends 14-55% less energy than similar products will make your gas bills a lot smaller. We like that this American Standard tankless model comes with sensors for high exhaust temperature, flame, gas leaks, and overheating. It just shows that safety is first here and that your restaurant will be completely safe even if this breaks down. When it comes to their warranty, American Standard offers a lifetime limited warranty on this water heater, which is more than good enough in our book. When you’re buying your very first tankless water heater, there are some things you simply need to know before you make the purchase. Now, you can always google what’s most important for these water heaters, but we already did the research. You just need to make a checklist when checking out a heater and see if it fits your needs. Electric or gas powered? Which of the two is more convenient for your restaurant? Outdoor or condensing units? Which is better from the financial aspect? Gas models are faster and more efficient, however, they do require venting. On the other hand, electric models don’t need venting, which saves money, time, and space – not to mention that all of this allows you to set up as many of these as you need in your restaurant. Outdoor models are perfect for people who want to use gas-powered water heaters without installing venting systems. Condensing models are the ultimate money-savers. They have a heat exchanger before the vent that enables them to capture thermal energy from the exhaust, which in turn lets them preheat the cold water while it’s entering the heater. Before you purchase a tankless water heater, check the warranty the manufacturer is offering. You see, with these models, there’s no tank that can start leaking after years of water-storing; hence, there’s no problem. Classic tank heaters last about five to ten years because of this problem. And that’s exactly why tankless models should last about 20 years or more. Because these heaters shouldn’t deteriorate after years of usage, the best models come with long-term warranties. When it comes to tankless water heaters, their size is only relevant for one thing – deciding where you’ll put them in your restaurant. Their size doesn’t determine how much hot water you can get out of them, or how many fixtures can be used at the same time, so forget about that. What really matters is the tankless water heater’s BTU and GPM. To simplify, more BTUs means more GPM, and more GPM means that your heater can handle a higher flow, which in turn means that it can handle more fixtures without a hitch. When it comes to tankless water heaters, a lot of dishwashing will not make you run out of hot water. However, if there are too many fixtures using warm water at the same time, the water might come out lukewarm. In order to bypass this potential issue, you need to either get a tankless water heater that can handle a big flow by putting out a lot of heat, or buy more than one heater. While there’s no huge tank that you would have to flush out, nor an anode that you’d need to replace, even these water heaters require some maintenance. Check what the model you want needs, can you do it on your own, or do you need a handyman, and how expensive the spare parts are. You want a model that will last for years, that will be easy to maintain, and that will not cost you an arm and a leg if it breaks down. If you found a model you like, check out what its users have to say. Do they like it, is it dependable, durable, simple to use? Or does it break down frequently and require constant care? Make sure that most of the people who bought the product you’re considering are happy with it. Checking out reviews is always a short, yet useful experience that will help you make your choice. We reviewed some of the best tankless water heaters available. They are reliable, they are efficient, and they are simply perfect for restaurants. If you want the best commercial kitchen tankless water heater, our top pick is the Rheem model. Finally, when it comes to choosing the right tankless water heater for restaurant –your restaurant – it’s all up to you.